If you were ever to ask me to recommend an audiobook service, Scribd would be the first thing out of my mouth. In my opinion, it’s the best service for the average book lover. I’ve been in love with this service since I discovered it almost two years ago. It’s been through a few incarnations since then, but I still primarily alternate between Audible (the powerhouse) and Scribd (the Jack of all trades). Scribd was started in 2007 as an e-reading service and added audiobooks to its menu in 2014. I was fortunate enough to jump aboard the Scribd train soon after that addition and, wow, was it a ride. In fact, I credit Scribd with turning me into the audiobookworm I am today. In those days, the audiobook service was “all you can eat listen”. Needless to say, my audiobook habit was quite satiated back then. It was pure heaven. Fast forward about a year and Scribd was forced to reel in its unlimited services due to the voracious appetite of its patrons… Oops. Scribd reinvented itself as a credit-based service, somewhat similar to Audible, but with a few key differences. However, as I detailed in an edition of Monday Discovery, Scribd temporarily brought back its unlimited audiobook feature for just over 2 months in mid-2016. Now that I know they has surprises like that up their sleeves, I’m not going anywhere. Scribd is perfect for those testing the waters of audiobook listening. The fact that Scribd offers eBooks in addition to audiobooks is the primary reason I recommend it so much, especially to new listeners. It offers the second best type of “low-risk listening” (with local libraries offering the first). If you decide audiobook listening isn’t for you, you’re still primed to take advantage of Scribd’s extremely robust eBook selection of over 1 million titles. And let’s not forget the price. If you live in the same world I do, money is usually a factor in your decisions. I’m pretty sure $8.99 < $14.95 is math a third grader could do. You could argue that the services aren’t comparable because of the difference in selection sizes, but I’d countered that argument by pointing out that the monthly $8.99 not only buys you one audiobook credit (just like Audible), but also includes three eBook credits. If you’re a reader and listener, this should be a no-brainer. You’d be getting four books (audio + eBook) and saving $5.96 per month. I love that kind of math, don’t you? Scribd gives you lots of books for your buck! I could make a list of all of the things I wish Scribd did differently, as I did when reviewing Audible, but there would only be one major item on it: Selection. When Scribd switched gears in September 2015, it retracted a lot of titles from its audiobook selection. If you’re new to the service, this might not even register as an annoyance with you. But as someone who remembers “the good ol’ days” of unlimited listening, that part of the transformation stings more than the credit system switcheroo. Still, it’s pretty great for the money. Scribd is also a subscription-only service which means there is no á la carte purchasing. There’s no way to listen without subscribing to the $8.99/month fee. They don’t run membership deals like Audible does, but they do have one nice little perk that is quite possibly my favorite thing about Scribd’s service: The referral program. You may have noticed my blue referral button in the left sidebar and thought it was a perk of being an audiobook blogger. Nope! It’s actually a perk of being a Scribd subscriber. Every Scribd member has a referral link that can be shared with family, friends, social media followers, or basically anyone. I’ve gotten referrals sitting in a pedicure chair before, just chatting with other patrons in the nail salon. The deal is that you get one month free (an $8.99 value) for every person who uses your referral link and they get 2 months free. They don’t even have to subscribe to Scribd, just use the link to get an extended two-month free trial. The standard free trial is two weeks, if you’re wondering. 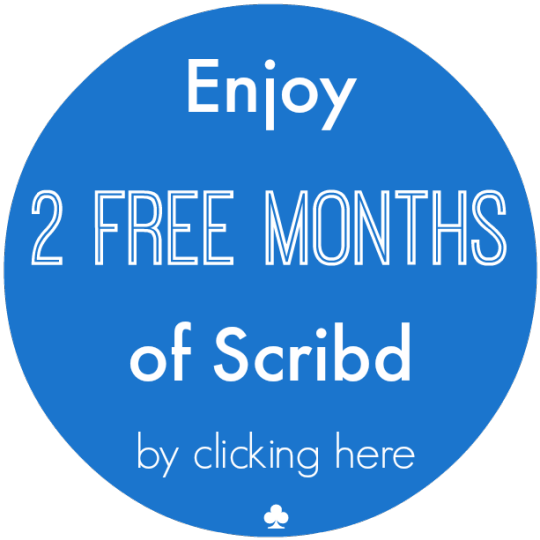 So all altogether the person you refer gets 2.5 months of free Scribd and you get 1-month. Not bad, eh? It creates this nice little chain of “paying it forward” that I just love! If this post has made you curious enough to give Scribd a try, you can start with the extended free trial my referral link offers and test the service out for a couple months yourself before deciding if it’s right for you. Not to blow my own horn, but I research a lot of services and if I’m saying that Scribd is my go-to recommendation, it’s definitely for a great reason. I’ve been a steady subscriber for almost 2 years, primarily because Scribd is a lot more wallet-friendly than Audible and it generally has what I need. When it doesn’t, there’s a “pause” feature available that puts your account on hold for three months at time, with no restrictions about how often you can pause (unlike Audible). Honestly, I think Scribd could just be branded “Best All-Around Deal”, but I especially think it’s beneficial (and more cost-effective) for new or “light” listeners. Many people have varying opinions on Scribd, so I’m eager to hear yours! Is this the first time you’ve heard of the service?